Most of us can recall a time when we pretended to be sick to reap the benefits that go along with illness. By playing sick, we gained sympathy, care, and attention, and were excused from our responsibilities. Though doing so on occasion is considered normal, there are those who carry their deceptions to the extreme. In this book, Dr. Marc Feldman describes people’s strange motivations to fabricate or induce illness or injury to satisfy deep emotional needs. Doctors, family members, and friends are lured into a costly, frustrating, and potentially deadly web of deceit. From the mother who shaves her child’s head and tells her community he has cancer, to the co-worker who suffers from a string of incomprehensible "tragedies," to the false epilepsy victim who monopolizes her online support group, "disease forgery" is ever-present in the media and in many people’s lives. 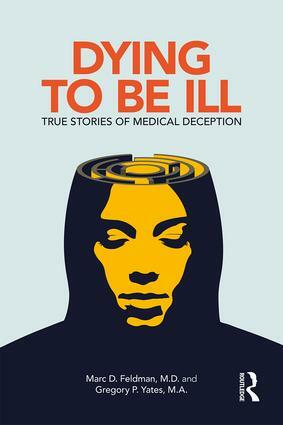 In Dying to be Ill: True Stories of Medical Deception, Dr. Feldman, with the assistance of Gregory Yates, has chronicled this fascinating world as well as the paths to healing. With insight developed from 25 years of hands-on experience, Dying to be Ill is sure to stand as a classic in the field.